DALLAS, TX – June 27, 2017: An eyewitness to the November 22, 1963 assassination of President John F. Kennedy, Charles L. Bronson was one of only four known home movie photographers to have captured the fatal shot on film. The Sixth Floor Museum at Dealey Plaza is honored to announce the donation of the Charles L. Bronson Collection, which includes an eyewitness 8mm color film, five still photos and documents and correspondence related to the images and film. Standing atop a concrete pedestal at the southwest corner of Main and Houston streets, Bronson took a series of still photographs and home movie film sequences of the moments just before and during the assassination in Dealey Plaza. His still photographs show the presidential limousine approaching Houston Street and then traveling north on Houston towards Elm Street. Another still, taken at the moment he heard the first shot, captures a blurred yet almost panoramic view of Dealey Plaza as the motorcade proceeded down Elm Street, with many key eyewitnesses visible. Bronson’s home movie includes a sequence filmed approximately six minutes prior to the assassination of an ambulance picking up an epileptic seizure victim in Dealey Plaza, an event that later became part of a conspiracy theory. The Texas School Book Depository is visible in the background. Because there was a possibility of movement in this brief glimpse of the sixth floor window, this film was of particular interest to the House Select Committee on Assassinations investigation and later film analyses. More significantly, Bronson’s film includes two seconds of the assassination—one of only four known home movies to capture the fatal shot on film. Although the Bronson film features the farthest perspective of these four films, it remains relevant more than half a century later as it helps disprove an ongoing theory suggesting that a Secret Service agent in the follow-up car accidentally fired the shot that killed President Kennedy. With this donation, The Sixth Floor Museum now owns the copyright to three of the four films that recorded President Kennedy’s assassination, including also eyewitness films made by Abraham Zapruder and Orville Nix. Media Note: The Bronson Film and Bronson 3 still image are provided for use by the news media from 11:00 a.m. CST Tuesday, June 27, 2017, until 11:59 p.m. CST Monday, July 3, 2017, ONLY. 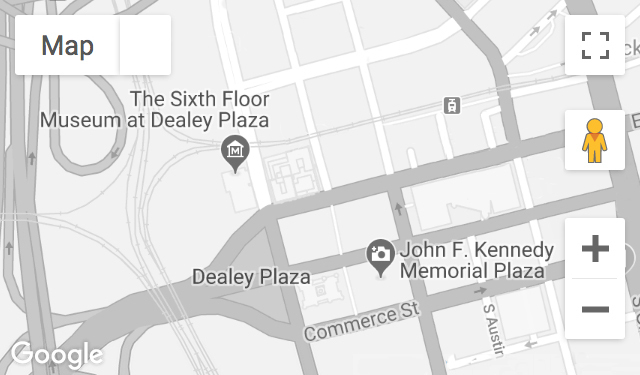 Any use after July 3, 2017 must be approved in writing by The Sixth Floor Museum at Dealey Plaza (https://www.jfk.org/the-collections/rights-reproductions-request-form/). The film can be found here: https://youtu.be/PWvkgMDWf8s. The Bronson 3 image can be found here: https://www.jfk.org/wp-content/uploads/Bronson-3.jpg. Please credit use of film or still image to: Charles L. Bronson Collection/The Sixth Floor Museum at Dealey Plaza. Located at 411 Elm Street in downtown Dallas, the Museum is open Monday 12 p.m. to 6 p.m. and Tuesday – Sunday 10 a.m. to 6 p.m. Audio guides for the permanent exhibit are included with admission and available in six languages, including ASL. For more information, visit jfk.org or call 214.747.6660.